The 5 largest U.S investment banks roped in ~$12.4 billion in debt origination fees in 2016 – almost 34% of the total figure for the industry. Total debt origination fees for the industry include fees from syndicated loans, and are taken from Thomson Reuters’ latest investment banking league tables. The chart below captures the total debt origination fees reported by the five largest U.S. investment banks since 2012. The green-to-red shading for figures along a row show the variations in these revenues for a particular bank over this period. After witnessing depressed activity levels in the second half of 2015, global debt capital markets saw a notable recovery over 2016 – helping debt origination fees improve at the industry-level. This allowed the largest U.S. investment banks to report a 4% increase in these fees compared to the previous year. However, their wallet share shrunk for the fourth consecutive year, primarily due to a steady growth in the Chinese debt capital market. As local players have a strong grip in China, the U.S. banks have had to contend with a smaller share of the rapidly-growing regional market – something that has had a negative impact on their global market share figure. After being displaced from the top spot by JPMorgan in 2015, Bank of America regained the #1 position in terms of global debt origination fees. 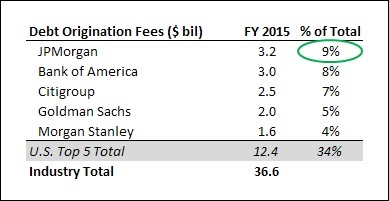 In fact, Bank of America has reported higher debt origination fees than any other bank in the world for 7 of the last 8 years (with the exception being 2015). How Much Of The Debt Origination Industry Did Major U.S. Investment Banks Capture in Q4 and FY 2016? How Have Debt Origination Deal Volumes For U.S. Investment Banks Changed In The Last 5 Quarters?